PARIS — A memorandum of understanding and cooperation between the Foundation for the Development of Culture and Arts under the Ministry of Culture of the Republic of Uzbekistan and the Louvre Museum was signed within the framework of the official visit of President Shavkat Mirziyoyev to France. 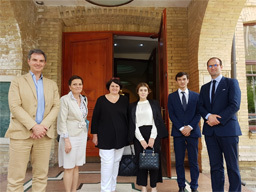 A delegation from the management of the Louvre Museum visited Uzbekistan from 9 to 11 May to prepare the next archaeological exhibition on Uzbekistan, at the Louvre Museum, in 2021, and to consider further partnerships, particularly regarding the restoration. According to the ministry, the document from the Uzbek side was signed by the Deputy Executive Director of the Foundation, Gayane Umerova, from the French side by the director of the Louvre Jean-Luc Martinez. According to the memorandum, the parties will cooperate in research in the field of history of art and culture, museology, restoration and conservation of cultural and historical objects and museum values, in disseminating the excavations of the French archaeological expedition in Bukhara by the Louvre Museum together with the Institute of Archaeological Research of the Academy of Sciences of Uzbekistan. It also outlined the exchange of specialists and the training of scientific and museum personnel, their training in advanced technologies and the practice of conservation, restoration, as well as modern methods of organizing the museum. The memorandum provides for an exhibition dedicated to the cultural heritage of Uzbekistan Civilization and Culture on the Great Silk Road in the fall of 2021 in the Louvre Museum. The exhibition will feature museum treasures that have not previously left the country. Taken together, these items will demonstrate trade and cultural ties and the importance of the geographical location of modern Uzbekistan, as an important crossroads of the ancient world.